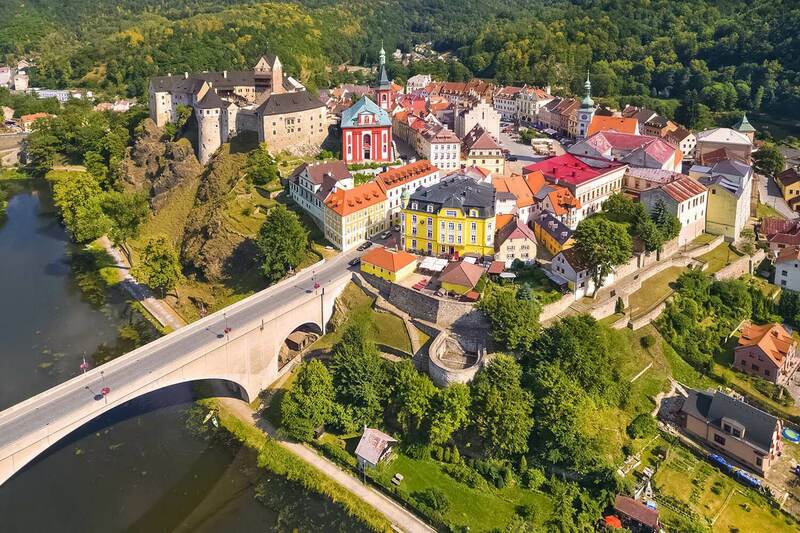 Loket is an extremely picturesque small town in the Karlovy Vary Region in western Bohemia. The word loket means “elbow” in the Czech language. The town owes this name to the fact that it is surrounded from three sides by the Ohře river and the shape of the river resembles an elbow. 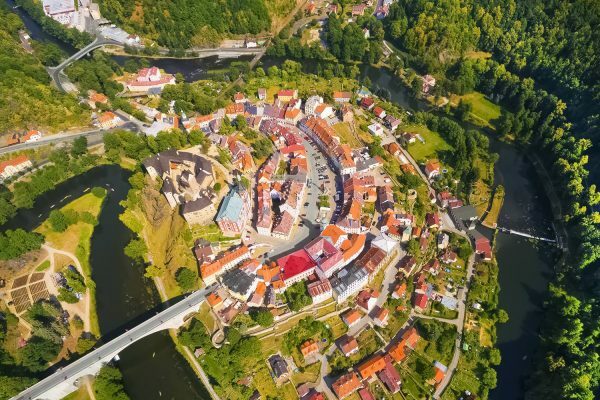 The town of Loket should not be confused with the village of the same name located in the Central Bohemian Region. 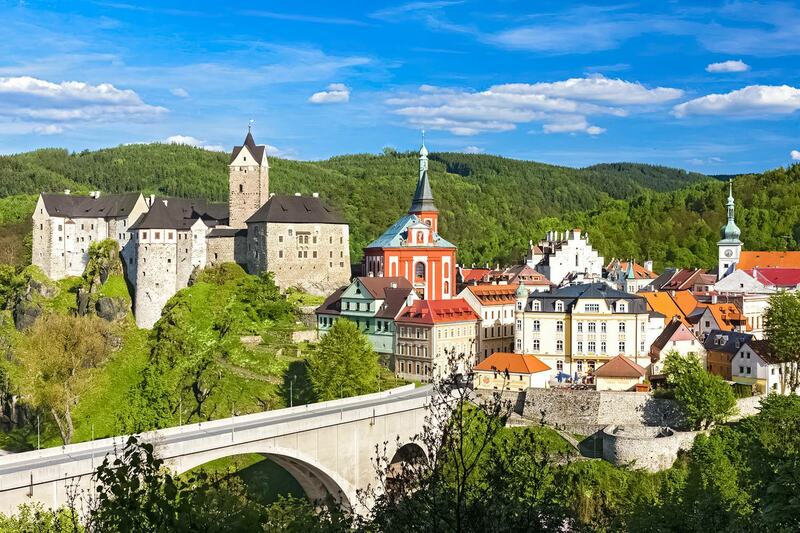 As you can see on the map below, the picturesque town of Loket is very close to the famous spa town Karlovy Vary and not far from the Czech-German border. Loket appeared in the famous James Bond movie from 2006, Casino Royale. It played the role of an unidentified town in Montenegro where James Bond and Vesper Lynd meet their MI6 contact person. Getting to Loket by public transportation is simple. There are frequent train connections from Karlovy Vary. Some of them are direct, others require changing trains in Chodov, Nové Sedlo u Lokte or Sokolov-Těšovice. If you’re on a direct train, the journey time should be around 20-25 minutes. Loket may be a very small town, but there are two train stations there: Loket and Loket Předměstí. If you’re going to Loket on a day trip, the distance to the Old Town is similar from both stations. Loket is probably a little closer. If you plan to stay there overnight, it is a good idea to check on the map which station is closer to your accomodation. Loket Castle dominates the town’s panorama. It was built on a rock near the Ohře river in the 12th century. Visitors can see a chamber of torture (rather brutal), a collection of arms and diverse old military equipment and an extensive collection of 19th and 20th century porcelain. The castle’s collection of precious minerals includes a fragment of the Loket meteorite (a.k.a Elbogen). It fell in Loket around 1400 and weighed about 107 kg (236 lb). The meteorite was cut into several pieces for scientific research. The fragments are in the possession of several museums in Europe and North America. The central section of T. G. Masaryk Street resembles a square and it is the very heart of Loket’s Old Town. The main landmarks are the Baroque town hall from 1696 and the Column of the Holy Trinity. There are a few hotels and restaurants on the square.